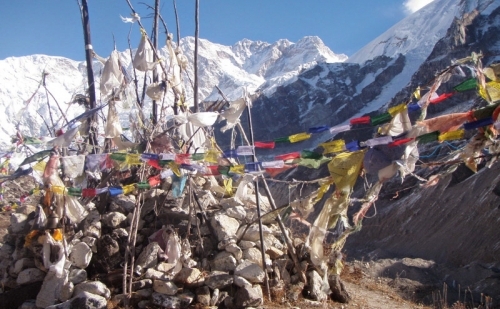 Dhulagiri Circuit Trekking is a challenging trekking. Dhaulagiri Circuit Trek has been recently reopened, and the thrill of exploration here is both enchanting and challenging. Mountain passes such as the French Pass is 5,360m high and Thapa Peak is 5,200m high and offers unimaginable views of Dhaulagiri, Annapurna, Throng Peak and Kali Gandaki River. The deepest gorge in the world, Gandaki Gorge is an unknown marvel. Walks on icy tracks passing mountain sheep and yak, exploration of the wild with frequent alterations in landscape and vegetation and majestic views of massifs of over 7,000m peaks makes the trip equally rewarding and challenging. 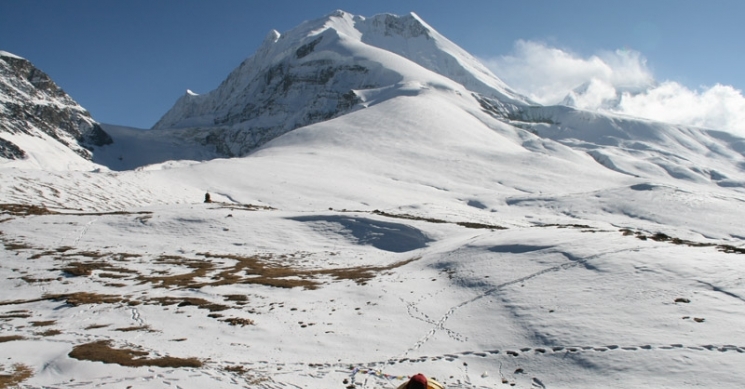 Dhaulagiri Circuit Trek is a strenuous journey through high alpine pasture lands, uninhabited valleys, passes at high altitude and even involves snow and glacier walking. Dhaulagiri the White Mountain stands 8,167m tall and is the seventh highest peak in the world. Considered one of the best for adventure treks simply as the route passes several 7,000m peaks and enormously varied geography. The trek begins after an eight hour drive from Kathmandi to Beni. Heading towards the north-west the trail moves through Babichour, Darapani and Muri in the subsequent days. Muri, the last formidable settlement along the trail is inhabited by the Magar tribe. Heading north following the trail on the banks of Myagdi Khola, we walk past villages of Baghar, Dobang and Sallaghari, ascending gradually. We rest for a day at the Italian Base Camp for acclimatization. Walking along the Chhanbardan Glacier we reach the Dhaulagiri Base Camp where massifs of giant mountains form an inspiring view. After ascending a steep incline, we reach the French Pass that lies between Tukche Peak and Sita Chuchura. A short descent towards the east leads to the Hidden Valley. Crossing the valley, we climb to Thapa Pass between Tukche Peak and Thapa Peak. Going downhill to Alubari and descending further to Marpha, a village on the banks of the Kali Gandaki, we move through Kalopani and join the Annapurna circuit trail following Tatopani, Ghorepani and Birethani all the way to Nayapul. Day 16 :Trek Yak Kharka to Jomsom (2,710meters) 5 hours. Day 17 :Thirty five minutes morning fly to Pokhara (900 meters) and sightseeing same day. A local government licensed English speaking Guide, cook, required number of porters, their food, accommodation, salary, insurance, equipment, medicine. International airfare and Nepal entry visa fee. Sightseeing/Monuments entrance fees in Kathmandu and Pokhara. Day 1 :Arrival; Transfer to your hotel in KathmanduArrival in Kathmandu. Our Airport Representative will meet you at the Tribhuvan International Airport. A drop to the Hotel by private tourist vehicle is arranged. You can either take a rest or meet us at our office and know the detailed arrangement of the Trek. Day 2 :Trek preparation day After breakfast, you will be introduced with the trek leader/guide at the hotel. This pre-trip meeting is for briefings on the trek and other necessary details. Please bring along your passport and three passport sized photos and a copy of your travel insurance policy. You can use your free time to rest or explore around and do some last minute shopping. A visit to the world heritage sites in Kathmandu including Swayambhu, Boudha, Pashupatinath, Kathmandu Durbar Square et cetera is also arranged as per request. Day 3 :Drive to Beni from Kathmandu (O/night Altitude 850m/6 hrs. approx. )The early morning drive to Beni after breakfast is scenic through the countryside. Beni, the district headquarter lies in the confluence of Kali Gandaki and Myagdi. Permits are checked at the police check post before entering. Overnight stay in Beni. Day 4 :To Babiyachaur (O/night Altitude 910m/7 hrs approx. )Heading along the banks of Myagdi Khola, the trek passes through Beni Mangalghat, Singa and Tatopani. Crossing the bridge after a short walk, the trail continues through Bholamza, another tiny village, before reaching a suspension bridge after a short walk near Simalchaur. Shortly after passing this village, the trail climbs to Babichaur where we unfold our tents for the night. Day 5 :To Dharapani (O/night Altitude 1,565m/6 hrs approx. )Today’s trek begins with winding paths along a mountainside alongside the valley that widens with approaching terraced hills. The easy trail is mostly flat with a few slight ascents. Shahashradhara, a small village along the trail is stone paved and further on, after crossing the Dukh Khola, we walk past paddy fields to reach Ratorunga, another village with tea houses and shops. The valley gets narrowed down again as terraces end. After following zigzags, the trail takes a steep ascent before reaching the densely populated village at Dharapani. Day 6 :To Muri (O/night Altitude 1,850m/5 hrs approx. )Descending to the Myagdi Khola and crossing to its west bank and climbing again, the trail starts taking steep ascents before it eases out along the ridge. To Muri, another small village, the trail climbs again and continues along Sibang and Mattim. After a yet another climb, we descend to Gatti Khola and reach Phalai. After crossing Dhara Khola, we once again reach the west bank of Myagdi Khola and climb a ridge to reach Muri, a large Magar village, where we tent for the night. Day 7 :To Baghar (O/night Altitude 2,080m/7 hrs approx. )After crossing a rocky stream and Dhora Khola, a river, we ascend to Ghorban Dhara where the first views of Ghustang South (6465m) can be seen. The trail then descends to Myagdi Khola and climbs along the mountainside along the right banks to Naura and further takes a steep grassy hill. The climb continues through a steep slope and finally descends along a forest that leads to terraced fields. We arrive at Baghar, a small mountain village where we camp in a yard or terraced field of the locals. Day 8 :To Dobang (O/night Altitude 2,520m/7 hrs approx. )Leaving the terraced fields, the trail moves through a ridge to a forest and reaches Jyardan, the remotest settlement in the area. Following the winding path that crosses a rocky area, we descend and climb again to reach Lipse. After walking through a forest and crossing Lapche Kharka, we climb again to reach Dobang where we camp for the day. Day 9 :To Sallaghari (O/night Altitude 3,110m/5 hrs approx. )Crossing the river, we ascend through a forested area, which is steep at times. At a clearing, the views of Dhaulagiri I becomes visible. Further, we reach a pine forest area or Sallaghari in Nepali, where a clearing suitable for camping is available. Day 10 :To Italian Base Camp (O/night Altitude 3,660/4 hrs approx. )Today’s walk goes through periphery of Chhonbarban Glacier and also passes small makeshift bridges and forest areas. The trail ascends further to the spectacular campsite at Italian Base Camp. It’s a strenuous walk, nevertheless, rewards with views of Dhaulagiri massif and Gurju Himal up close. Overnight stay in a tent. Day 11 :Acclimatization Day (O/night Altitude 3,660m)Before moving further into higher altitudes with thinning air, we take a day to acclimatize ourselves in this high altitude. You can explore around the Base Camp and prepare for the next day’s climb. Overnight in tent. Day 12 :To Japanese/Advance Base Camp (O/night Altitude 4,440m/5 hrs approx. )As the trail ascends, its gets challenging at some places. Use of ropes in certain sections adds to the safety of the climb. Also an early journey is taken to avoid avalanches and rock falls. 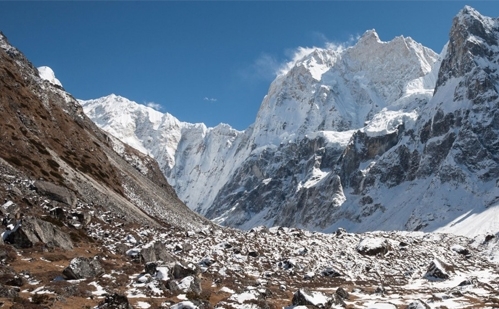 Through a rocky portion, we climb a mountainside and cross two glaciers that originate from Dhaulagiri. The other side of the glacier is a grassy land known as Pakhaban or Japanese/Advance Base Camp. Dhauligiri and Tsaurabong Peak stands massive above the camp. Overnight stay in a tent. Day 13 :To Dhaulagiri Base Camp (O/night Altitude 4,750m/4 hrs approx. )The gradual increase in altitude and hiking in glaciers makes today’s walk difficult. After passing a rocky ridge, the trail descends to along the glacier and directs towards the Dhaulagiri Base Camp. Impressive views of Dhaulagiri along with the adventurous walk gives the thrill of being in the mountains. Overnight stay in a tent. Day 14 :To Hidden Valley via French Col (O/night Altitude 5,010/7 hrs approx. )Another day of strenuous walk through glaciers and high passes. Crossing the glacier from the base camp with the help of ropes, the trail eases out a little, but again picks up to another strenuous climb to the top of French Col (5300m). Here, the Hidden Valley opens up along with giant snow peaks surrounding the valley namely Mukut Himal, Tashi Kang, Sita Chuchura, Tukche et cetera. From Thapa Pass (5250m) that lies between Tukche and Thapa peak, we descend to the extremely cold valley where we camp for the night. Day 15 :To Yak Kharka (O/night Altitude 3,680m)It’s a downhill walk for most of the day although difficult sections come across at places. The trail moves on from the Hidden Valley to Dhampus Pass and takes a dangerous section of avalanche prone slopes which continues all the way down to Yak Kharka. Day 16 :Trek Yak Kharka to Jomsom (2,710meters) 5 hours. Descend to the village of Marpha, on the west bank of the Kali Gandaki River. Marpha is home to many apple orchids as well as all the various food products made from fruit. Apple Brandy is a local specialty that you may be lucky enough to taste en route. Continue north, up the river valley to the town of Jomsom. Overnight at tented camp. Day 17 :Thirty five minutes morning fly to Pokhara (900 meters) and sightseeing same day. Today 35 minutes morning flight takes us to Pokhara from Jomsom. Once we arrived at Pokhara airport, we then drive to hotel. In the afternoon we will have a sightseeing tour around Pokhara valley, which covers Fewa Lake, Devi’s water fall, Museum, Tibetan refugee settlement and Gupteshower cave etc. Overnight at hotel. Day 18 :Drive back to Kathmandu from Pokhara (884m)Returning from Pokhara to Kathmandu, you can explore around the city. We have a small farewell dinner, celebration for the successful completion of your journey. Overnight stay at a hotel. Day 19 :Final Departure or onward for next program Departure from Kathmandu. A drop from the hotel to the airport 3 hours before the scheduled time of flight is arranged in a private tourist vehicle. 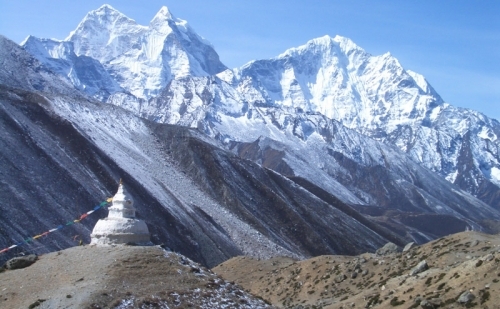 You can also opt for another package with Green Valley Nepal Treks and elongate your stay.